Lost And Led Astray’s Sarah-Jane Duff is so much more than a fashion designer. She is a proud advocate for FATshion, and an activist for fat positivity, spearheading the Health At Every Size (HAES) movement in New Zealand. In 2016 she launched Fat Yoga, an inclusive, fat positive yoga class for people of all sizes, and late last year held the inaugural “Fat Talk” held at her K Road shop and studio. She started her label Lost And Led Astray in 2014 in response to the lack of fashion available for bodies like her’s in New Zealand. Every LaLA piece is made locally in Auckland, a decision that Sarah-Jane made when she started her label to ensure workers are treated and paid fairly. She also sources fabrics that are environmentally friendly, such as linen and tencel. Sarah-Jane also happens to be an old friend and one of my all-time favourite people. She is a purpose-driven woman who takes no sh*t. I spoke to Sarah-Jane in her beautiful light-filled K Road studio, about FATshion, Fat Yoga, and the politics of fat bodies. What made you DECIDE TO START a FaTshion label? Growing up, I found it really hard to find clothes. When I was at art school I was hand-making my own clothes, and it was there I decided to go to fashion school. While I was there I was offered an amazing opportunity to work for the Carpenters Daughter. It helped me to learned more about my body and my place in the world, but I also became more angry as I started learning about fat discrimination. 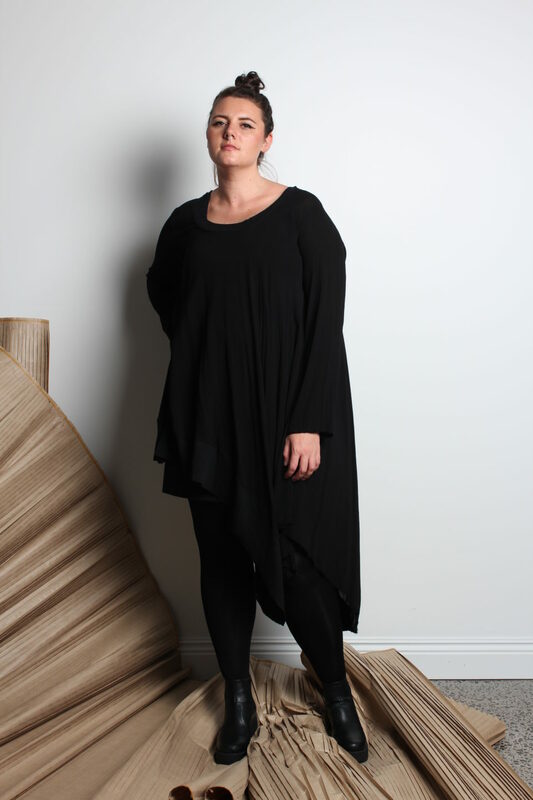 I started becoming an activist and now with my own label, I talk about FATshion, rather than using euphemisms like “clothing for curvier women”, because we are ok as we are, and we need to remove the stigmatism with the word “fat”. Over the years I’ve been disappointed with a lack of clothing that properly fits fat bodies, while also being stylish. So many people have spent years buying clothing because it fits, rather than because it fits well. Because fat people are conditioned to think their body is something they need to change, the thinking is “I’ll buy cheap and I’ll buy whatever just fits”, instead of investing in pieces that last and make them feel comfortable. That’s been an issue with me at my price point - people believing they are worthy of designer clothing. In terms of inclusivity and diversity, we’ve come a long way in other areas, but I believe fat acceptance is the final frontier of diversity. Our inherent dislike of fat bodies is taught from childhood. I don’t think that oppression of fat bodies and diet culture and where our standards of beauty have come from are being talked about properly yet. I don't think people actually understand that it's a feminist issue, and has roots in colonisation. WHATS BEEN YOUR BIGGEST CHALLENGE IN RUNNING A NZ MADE FASHION LABEL? First of all, fashion is viewed as a woman’s industry, which automatically means people aren’t paid properly. There’s also a lot of expectations of free labour in the industry and free labour labelled as “internships”, which I don’t agree with. Because of our consumer culture, people aren’t willing to pay for clothes at a price point where people at a manufacturing level aren’t able to pay the correct amount. We all want a pay rise within our own profession and within our own roles, but then we’re so willing to only buy bargains or shop sales and consume more rather than think about quality. That’s been a huge shift with mass consumerism and I’m hoping with this next shift of looking at sustainability people will actually consider the process behind the clothing they’re buying. If something takes two hours to make, and the person made it was paid a living wage, then the starting point is $40. Someone had to also cut it which can take a really long time, plus the fabric – how long did it take someone to make the fabric, let alone the person who designed it, the shop you bought it from, etc. There are so many stages within the production of clothes, each adding to cost of production. We’re seeing more labels describing themselves as ‘ethical’ and ‘sustainable’. WE know that you pay your workers properly, you have everything made made locally in NZ, you source sustainable fabrics, and yet you don’t ever use the words ‘ethical’ or ‘sustainable’ in your branding. Why? Because I don’t think that until I have full transparency that I can. Until I find out where the thread is made, I can’t. It’s hard to know the full story behind the fabric we buy through wholesalers, because the transparency has just never been there. It would be massive undertaking and another cost that the consumer would probably not be willing to pay. Something I do is research the environmental impact of the fabrics I use. I use viscose, rayon and linen the most, because I believe they have the lesser impact on the environment – things like how much water they use, and what chemicals are involved in their production. Also I do manual cutting rather than computer cutting due to the plastic used and labour loss in this process. I think as things are changing in China, particularly around their employment laws, we will start to see more accountability. Things are changing, but when you’re small it’s hard to be an agent for that change, and you actually have to rely on the bigger guys to make the changes for you. Tell us about Fat Yoga! I wanted to create a community where people can come and feel safe and enjoy their bodies and actually realise their bodies are strong and they do something incredible for them every day by just existing. I called it ‘Fat Yoga’ because I believe we have to stop thinking of this word as anything than just a descriptor. It doesn't mean all these other negative connotations that come with it. It's amazing seeing how Fat Yoga can change women's relationships with their own body. I had one of my regular yogis come in to the store yesterday. When she started Fat Yoga she was really shy and would wait in her car until right before the class started. Yesterday she was in here in her bra trying on clothes. You can visit Sarah-Jane’s beautiful shop at 482 Karangahape Rd in Auckland or online at Lostandledastray.co.nz. Follow LALA on Instagram and Facebook. To learn more about Fat Yoga, head to FatYogaNZ.com or check out their Instagram and Facebook page.